Ayesha is attacking Star-Lord with her remote-controlled Golden Drone spaceship! 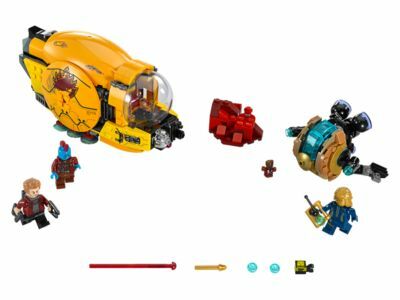 Fly Yondu in the Laser Drill to the rescue and fire its powerful spring-loaded missile at the red cliff, and send Ayesha tumbling over the edge. Together the Guardians of the Galaxy Super Heroes can win! Price is 1% below the initial Lego retail price, a € 0.31 discount! This comes down to 10.73 cent per brick. The Ayesha's Revenge (76080) Lego set is available from the sites below. However, they do not offer delivery to your selected region. The Ayesha's Revenge (76080) Lego set is no longer directly available from the sites below. However, 3rd party partners of these sites might still have the set available. Alternate description Team up to take on Ayesha and save the galaxy!